Pictures from this year's fair, including many that never were seen in print, available for purchase. 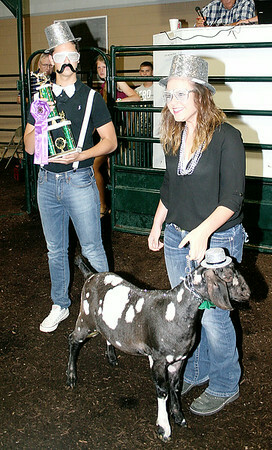 Jacy Hill (right), who exhibited the grand champion dairy goat wether at this year's 4-H Fair, enlisted the help of friend Ethan Zimmermann in adding sparkle when she sold the animal, named "Chacho," at Thursday's 4-H Fair Livestock Auction. Hill received $3,000; more coverage of the auction will be in Saturday's Lebanon Reporter.